Tis the Season! If you have previously created a custom Memoji on the iPhone, perhaps you want to spruce it up for the holiday season and toss a fancy Santa hat on your Memoji creation. Or maybe you want to create a brand new custom Memoji of your own uniquely special Santa Claus for your own magical Christmas purposes. Whatever the reason, it’s Christmas time, and you can put a Santa hat on a Memoji. The Santa hat is always visible in the Memoji creation tool under head ware, but it’s not red by default and it’s kind of hard to identify as a Santa hat because of that. Not to worry if you overlooked it, we’ll show you how to get your fancy Memoji Santa hat going on. 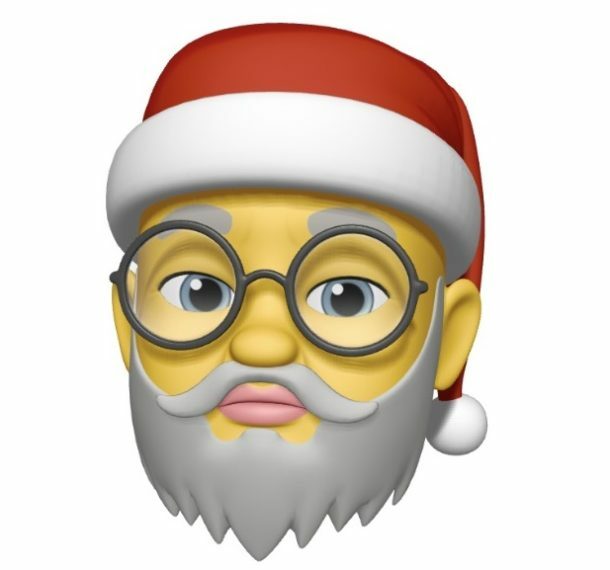 Now you’re free to use your Santa hat Memoji as you want, just like any other Memoji or Animoji. Send it to everyone you know, make a goofy video with one and turn the Memoji into an animated GIF, or just hoard it to yourself knowing you made the worlds most amazing Memoji and now it has a Santa hat too. As usual with Memoji and Animoji, you must have a new model iPhone to have access to the features. This includes any iPhone XS, XS Max, XR, X, or newer, and it must be running iOS 12 or later. And that’s whether you’re using the Santa hat or not. You should put AT THE Top what iPhones this works with. Not at the bottom! And that holds true for all your hints and tips. Thank you. And A Very Extra Merry Christmas to Laura, it sounds like Laura needs some Holiday Spirit! Absolutely agree with Laura. Wasted my time trying to sort out why I could not accomplish the listed steps. What were you thinking? Nice article, and then I came to the comments hoping for some festive iPhone discussion and pleasantries to discover Baby Laura and Crying Cal having a temper tantrum. Oh wittle Cal and Laura, you poor lil things, you tried to use a new feature on your old iPhone and discovered it wasn’t possible because the old iPhone is old and does not have all the latest stuff, awwwww you must be real sad about that! It’s almost like you read something and learned it didn’t apply to you! Life will have many such lessons Baby Laura and Crying Cal, you will see as you leave toddler preschool that not everything is centered around you! Oh you must be having a big temper tantrum over there in your cribs, wittle toddler Cal and Laura! You two want a cookie and to sit in time out for a while?? Maybe you can ask Santa for a new iPhone for Christmas! What a couple of cry baby entitled fools. I read internet comments and suddenly I understand why the world is in the state of affairs. 183 words. Let’s hope you feel better now. Which you CLEARLY have not. If you do not own a phone capable of Animoji/Memoji – and I’m pretty sure ANY iPhone owner would know what model of phone they own and what that phone’s features are – why would you try and do this? Are you really THAT stupid? Do everyone a favour and move to Android.